A fine example of J. 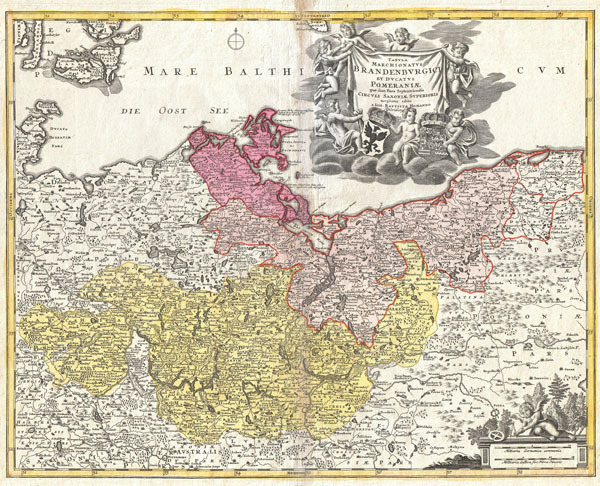 B. Homann's c. 1720 map Brandenburg and Pomerania, Germany. Shows Frankfurt, Brandenburg and Berlin. Also includes parts of Denmark and much of Poland. The map is filled with information including fortified cities, villages, roads, bridges, forests, castles and topography. Title cartouche in the upper right quadrant features cherubs and armorial shields for both Brandenburg and Pomerania. There is a legend in the lower right quadrant. Prepared in Nuremberg by J. B. Homann and issued in Homann's Grosser Atlas as well as in the Homann Heirs' Maior Atlas Scholasticus. Very good condition. Minor centerfold discoloration starting in upper margin extending slighting into the map. Blank on verso. A fine dark impression. Rich original color. Mickwitz, A. The A. E. Nordenskiold Collection in the Helsinki University Library, I,91.